I was so excited when Stephanie at Wife Mommy Me nominated me for the Sisterhood of the World Blogging Award. Stephanie is one of my favorite mommy bloggers. Our sons are almost the exact same age (just a few days apart) and I feel like we are so similar in parenting styles! She gave me 10 questions and here are my answers. 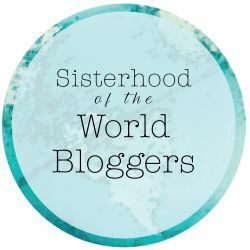 Be sure to read to the end to see who I nominated for the Sisterhood of the World Blogging Award and the questions I've come up with. Oh I feel like I have so many guilty pleasures, but the one that sticks out in my head is the TV I watch. I watch a lot of TV shows that will never be critically acclaimed or are considered for a much younger audience. Some of my favorite shows are Pretty Little Liars, Big Brother, and Dancing with the Stars. 2. How many states have you been to? Which is your favorite? Your least? While I've done a fair amount of traveling, not much of it has been within the United States. I've been to 14 states (if I'm counting correctly). My goal over the next few years is to visit many more states with Chris and Noah! My favorite state so far is probably California. I've gone a few times for work and went for fun with Chris back in 2011. I absolutely loved San Francisco and would love to take Noah back. My least favorite state doesn't really have much to do with the state, but more because of the crummy weather we had when we were there. I had such high hopes for Vermont and then we had some super rainy and cold weather... I really hope to go back and have a different experience. 3. What is one food you could eat over and over again for breakfast, lunch, and dinner? 4. Share the last time you completely embarrassed yourself. 5. What's your zodiac sign and do you think it fits well with who you are as a person? I am a Pisces but I've honestly never felt it fits well with who I am. Instead, I feel like I'm more like a Virgo. 6. What is the last movie you watched at the movie theater? I started blogging when Chris and I got engaged. It started off as a place to post wedding details and plans as they happened. Looking back, it's quite embarrassing. I would then blog about family gatherings and holidays. When I got pregnant with Noah, I started weekly bump posts, but I honestly didn't start blogging on a super regular basis until after I had Noah. 8. It's #pumpkineverything season. What's one pumpkin flavor treat you love? One you dislike? This may be shocking, but I really dislike pumpkin flavored anything! I don't think there's one thing I really love. Probably a donut or chocolate pumpkin bread would be okay, but there's so many other treats I'd prefer. 9. What was the last book you read and loved? I read The Summer I Turned Pretty series this summer, and while it's more geared towards teenage girls, I really enjoyed it. I guess that's another guilty pleasure... all things Young Adult. 10. Fall is upon us in Ohio. Share 3 things you are most looking forward to this Fall. I love Fall and everything about it. I'm especially excited for the cooler weather so I can wear boots, scarves, and jackets. We also have many family birthdays in the Fall. I love spending time with my family and love any excuse to celebrate with a cake :) Finally, I'm super excited for all the fun things we have planned, like going to the pumpkin patch, visiting friends in Boston, and everything involved with Halloween! 1. If money didn't matter, what would you do? 2. What are your top 3 vacation destinations on your travel bucket list? 3. What is your favorite type of food? Italian, Mexican, American, etc? 4. What does your "mom uniform" look like? 5. What are your top 3 favorite TV shows of all time? 6. How did you meet your spouse? 7. With all the holidays approaching, what are some of your favorite family traditions? 8. Do you find your children take after you or your husband more? 9. What's the last book you read that you loved? 10. If you had an entire day to yourself, what would you do? You had me at cheese!!! LOVE IT. I am with you on pumpkin stuff...not a fan! I'm a huge TV addict too. Who are you rooting for in DWTS this season? Sign me up for the YA guilty pleasure club!! Thanks for the shout out. I'll work on this one! I'm a huge tv addict too... especially when it comes to trashy tv! Also, I totally want to see The Intern also! Looks so good! I am one of those that like all the pumpkin but prefer for it to be subtle. If it wasn't for blogging, I would watch TV all the time. But between C and trying to keep up with blogging, TV gets pushed back and I usually have to binge watch all my favorites in one evening.